A Successful Celebration of CCO Success! A large and diverse group of people attended the August 12 CCO Celebration sponsored by MVHCA, League of Women Voters of Corvallis, Health Care for ALL Oregon-Abany, Interfaith Health Care Network, and Corvallis Physicians for a National Health Program. At MVHCA we are taking a keen interest in the Coordinated Care model because we realize that Oregon doesn't just need to change the financing of health care to a publicly funded (or single payer) system, but also needs to transform how care is delivered to give everyone the care they need when they need it in an equitable and affordable way. Assisters from the Benton County Health Department were on hand to provide information about signing up for health care coverage. There was an amusing and educational skit about the difference between the old way of providing care and the coordinated way making use of Patient Centered Primary Care Homes (PCPCH). In this photo MVHCA Chair Ron Green holds the title card while Ann Brodie introduces the skit. The skit illustrated how the focus of the PCPCH is centered on the patient, and services like physical, mental, and dental health are coordinated to give the patient better health, better care, for a lower cost -- known as the Triple Aim. Here, the "Old Way" Dr. Sorry Imlate, played by Mike Huntington, takes a phone call from his wife while patient Shelley Ries waits and wonders why he has no time for her list of questions. Following Dr. Sorry Imlate, "CCO Way" Dr Still Imalate, played by Tessa Green, took the time to examine the patient and introduce her to a councilor who will help her with her depression. After the skit, Dr. Kristen Bradford, MD, Medical Director , Community Health Centers of Benton and Linn Counties, shared stories from Oregon Health Plan members about how having affordable coverage has changed their lives. Judy Sundquist, MPH, RD, discussed the metrics that are used to measure the performance of Oregon's Coordinated Care Organizations and commended InterCommunity Health Network Coordinated Care Organization (IHN-CCO) for it's improvements in access to care, immunizations for adolescents, patient satisfaction, medical assistance with smoking/tobacco cessation, and developmental screening of children - first 36 months. 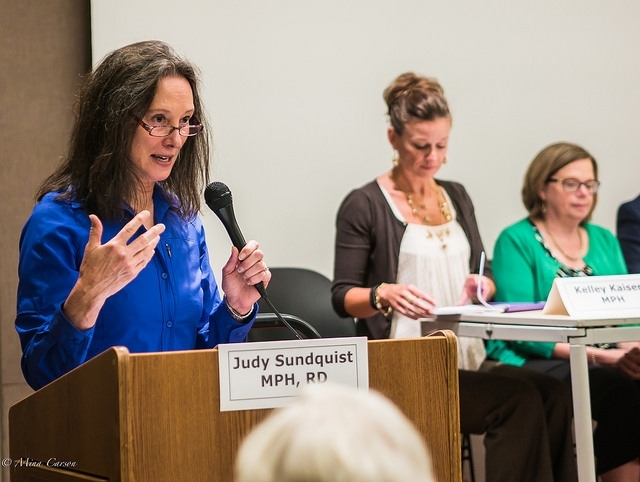 Judy introduced the panelists who spoke about how much the change to coordinated care has helped them in serving the Oregon Health Plan (OHP/Medicaid) members who are in their charge. The panelists consisted of Kelley Kaiser, CEO of IHN-CCO; Sherlyn Dahl, BSN, MPH, Director of the Federally Qualified Health Centers of Benton and Linn Counties; Kevin Ewanchyna, MD, Chief Medical Officer; and Larry Eby, MD, Chair, IHN-CCO Community Advisory Council. The panelists made the point that the transformation to coordinated care will not only help OHP members, but the improvements will be implemented for everyone needing care. They emphasized that they do not envision a 2-tiered system of health care. Governor Kitzhaber recorded a video message of congratulations on the 2 year anniversary of IHN-CCO and it's many accomplishments. There was time for questions from the audience, and then everyone enjoyed the refreshments. Thank you to all who organized, presented, attended, and asked insightful questions. A special thanks to Mina Carson for taking the photographs used here.